BRISTOL, Tenn. (AP) - Kurt Busch stole the spotlight from his younger brother Saturday night at Bristol Motor Speedway to grab an overdue short-track victory. Busch won for the first time this season but sixth on the 0.533-mile bullring he once dominated. But that was before younger brother Kyle Busch learned his way around the place, and Kyle Busch has been the master of the Tennessee track. 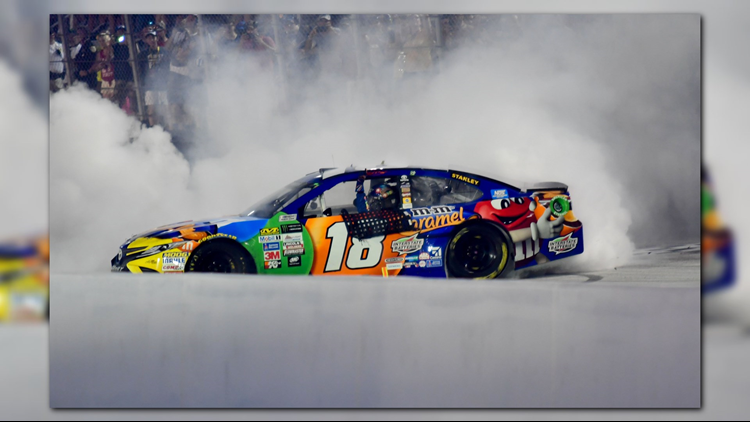 Kyle Busch, winner of seven career Cup races at Bristol, chose the song "All I Do Is Win" by D.J. Khaled to play as he was introduced before the race. The crowd responded with a thunderous boo, and Kyle Busch's eventful evening was off to a roaring start. Kyle Busch triggered a 15-car accident just two laps into the race. He fell two laps off the pace, came back to race Martin Truex Jr. for second, and moved Truex out the way late in the race. A frustrated Truex kicked his car in anger. As Kyle Busch was tending to his wounded race car, older brother Kurt battled Stewart-Haas Racing teammate Clint Bowyer for the lead. Kurt Busch was relentless on the restart and got his Ford to the front, then Kyle Busch spun to bring out a ninth caution. Kurt Busch had a good restart but Kyle Larson, on fresher tires, was desperately trying to catch him for the win. Kurt Busch held him off and Larson, winner of the Xfinity Series race on Friday night, finished second in his bid for the Bristol sweep. Kyle Busch wound up 20th.